Bonosus was a tribune under the Emperor Probus. He was of British descent being born in Hispania (Roman Spain). His father was British and his mother was Gallic (French). Bonosus fought unsuccessfully against the Germans. 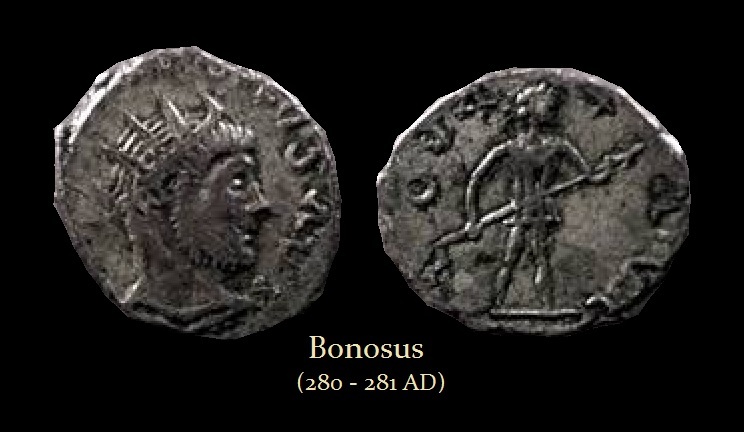 Bonosus was proclaimed Emperor at Cologne along with his colleague Titus Ilius Proculus who was known to history only by the writer of Historia Augusta who reported that in 280 AD Proculus accepted the purple and took as colleague Bonosus. Following his defeat by the Germans perhaps out of fear about what Probus‘ reaction might be to his failure. Probus indeed marched against Bonosus who was once again defeated. Bonosus‘ wife and two sons who were treated with honor by Probus, which was very unusual. Legamen ad paginam Latinam Bonosus was a Spaniard by birth, but in descent a Briton, though he had a Gallic mother. His father, so he himself used to say, was a rhetorician, but I have learned from others that he was only a teacher of letters. He lost his father when a child, and being reared by mother, a very brave woman, he learned nothing of literature. He served in the beginning as a legionary centurion, and next in the cavalry; he commanded in the ranks, he held tribuneships, he was general in charge of the Raetian frontier, and he drank as no man had ever drunk. In fact, Aurelian used often to say of him, “He was born, not to live, but to drink,” and yet, because of his prowess in war, he long held him in honour. Indeed, whenever the envoys of barbarian nations came from any place, they were plied with wine in order that he might make them drunken, and when they were in wine learn from them all their secrets. But however much he drank himself, he always remained calm and sober, and, as Onesimus, the author of a Life of Probus, says, when in wine he was all the wiser. He possessed, furthermore, a marvellous quality, namely, that he could always discharge all he had drunk, so that neither his stomach nor his abdomen nor his bladder ever felt any discomfort. Legamen ad paginam Latinam He, then, at the time when the Roman galleys on the Rhine were burned by the Germans, fearing that he might have to suffer punishment, seized the imperial power. This he held longer than he deserved, for he was finally defeated by Probus only after a lengthy and difficult struggle, and he put an end to his life by the noose, which gave rise to the jest that it was not a man that was being hanged but a wine-jug.